Our membership structure changed in 2017. New and renewal membership levels will be Bronze at $15, Silver at $25, Gold at $50, and Platinum at $100. Life memberships will continue to function the same and will remain a one time donation of $250. 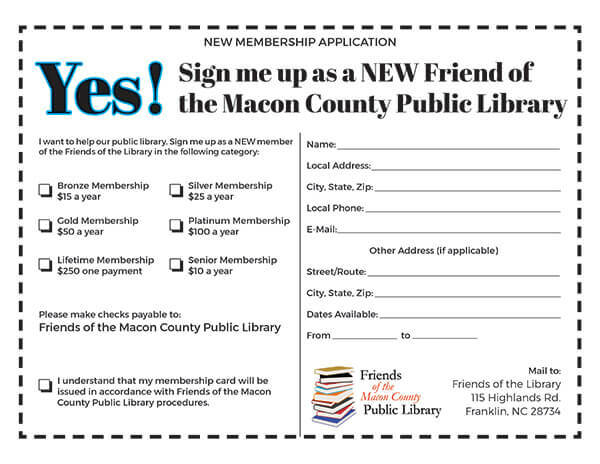 This should help to eliminate some confusion for new members as to what level of support is right for them and help the Friends of the Library continue to support the programs and services our public library provides as it continues to face increasing financial pressure. Your membership in the Friends is very important to us.